Premium split nylon/polyester blend microfiber provides optimal wet mopping performance to pick up spills with over 24 oz of liquid. 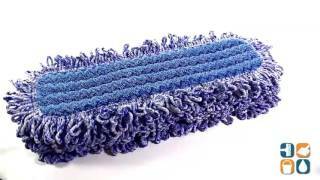 Unique looped construction and dense ultra-fine quality fiber removes dust, dirt and bacteria, while the advanced hook-and-loop backing holds-up under harsh laundering conditions and attaches pads more securely. Double finished edges retain pad shape with use over time. 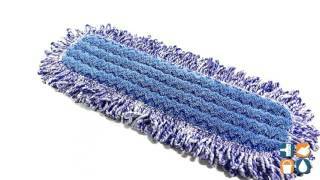 Head Type: Pad; Application: Floors; Mop Head Size: 18 x 5.7; Mop Head Color: Blue.